PT/35(b) was found, we are told, in PI/995 which is the collar of a grey “Slalom” shirt. Three other parts of that shirt were recovered. We shall talk about them later on. Here is where these items where found. We will document this information. Blue and red bands are the trails left by the debris of the plane. Thank you for creating this website, also for your previous extensive posts on this subject. As a proud Scot, this whole shameful matter is an appalling stain on Scotland and will never go away. Respectfully, I will take this opportunity to pass my heart felt support and wishes to the families involved. Has it ever been established why the jump from PT2 to PT35[b] ? Why wouldn’t the notes state a fragment of a green circuit board carrying a very prominent “1” on it ? By chance, without this “1”, would it ever be possible or likely to match this with the supplier or manufacturer of the board ? It seems so obvious as a direct arrow to go direct to Mebo. If there actually was a fragment of green circuit board but then switched for Mebo “1” for subsequent photo ? Without that “1”, could be anything in the notes. And why do the notes go into so much detail with a supposed manual but do not state the so obvious, front and centre “1” of the green fragment. Not only does it not make sense, it doesn’t equal & agree with the process of examination which was supposedly taking place. The dates of the notes have been annoying me for quite some time; More time than I would like to acknowledge, the reason being is believe there is something in there but not sure if I am connecting the dots. As Morag as pointed out, there is definitely discrepancy with the date of the photo and the acknowledged latitude given to the now discredited RARDE representatives. There is a 2 month break between ongoing examination and notes. Why would detailed examinations just stop on or around mid-March 1989 and then resume mid-May 1989 ? Hi Craig. Hopefully Ludwig won’t mind us discussing on his blog. I think blog discussions like this are an excellent way to clarify stuff and find out new information. I don’t understand the PT numbering sequence either. I suspect, though, that the explanation might be that at the time of his original examination Hayes extracted relatively few fragments from larger items and gave them their own number, and the radio manual scraps were one of these (PT/2). I think Hayes later made one or probably several additional passes over the stuff extracting more interesting fragments and numbering them as he did it, not necessarily in the order the parent items were originally examined. A lot of the PT designations seem squeezed in retrospectively and the numbering isn’t consistent in any way. I don’t see why the notes would be expected to describe the fragment the way you suggest. Hayes was good at drawing and he tended to draw the bits of debris to emphasise what was striking about them. The oddity is that he didn’t draw the fragment. (Also that the green colour was on the reverse, not on the side with the circuitry, but he didn’t mention that.) The relay pad isn’t actually a number 1 anyway, it just looks like it if you turn it up a certain way. As far as I can see, that fragment is the only square cm of either of the two circuit boards in the timer which had a distinctive enough pattern on it to allow it to be traced by a visual comparison to the MEBO product. Make of that what you will. In fact page 49 is potentially crucial. The date at the top is 15/3/89 and the top half of the page described a small piece of the baggage container, AH/152. That description stops just over half way down the page and a new entry starts, PI/991, and the date on that is 15/5/89. That item is the detached handle of Michael Bernstein’s maroon suit carrier, with bits of blue foamy plastic from the Coyle Tourister blasted into it. The bit about the Tourister fragments being extracted from the handle and bagged separately as PT/54 is crammed into the bottom of the page. Then page 50 goes back to 12/5/89 and describes two items of clothing (PK/1064 and PK.104) and then piece of the base of the Coyle Tourister (PG/112). The famous page 51 is also dated 12/5/89. My tentative impression is that Hayes was so taken with the scraps of radio manual that he barely gave the piece of circuit board a second glance. He gave them their own PT number and drew both sides of every sheet. (Interestingly, he didn’t examine Decky Horton’s larger piece of the manual until 16/5/89, although he may have seen it on 11.5.89, the day before the examination of PI/995, en route for fingerprinting.) But for whatever reason, the scraps of paper got his full attention and the PCB fragment almost none. Then page 52, the first of the renumbered pages, reverts to 15/5/89. We’re back on to the Coyle Tourister with PH/552, which is another piece of the base, the other end from PG/112. 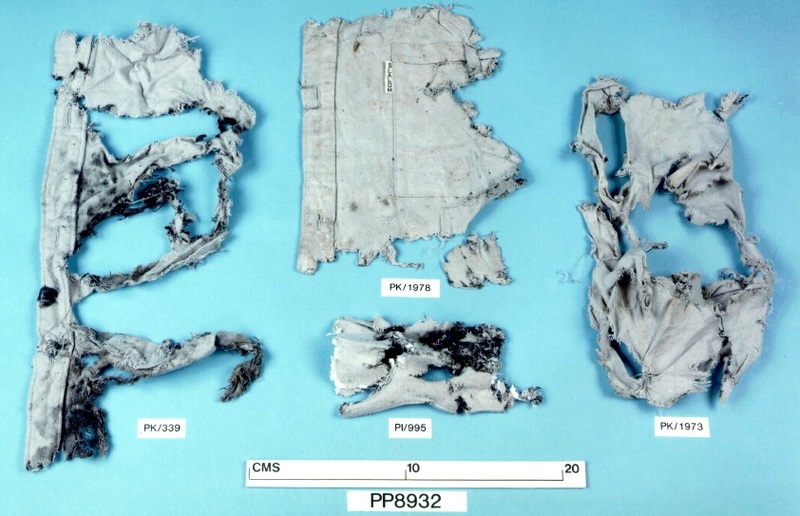 Then we’re on to PI/679, a bag with some clothing and assorted bits of plane. The date of 15/5/89 continues for all the renumbered pages, that is up to page 56, and page 57 (not renumbered) is dated 16/5/89. Work dated 16/5/89 contnues right up to page 63, and page 64 is the start of 17/5/89. However there is an interpolated page 60a which is dated 30-5-89. Just to demonstrate how disorganised it all is. It really looks as if page 52 (which was originally numbered 51) should follow on from page 49, both describing work done on Monday 15th May, but then 50 and 51 have been added in. The ESDA testing showed that pages 53 to 59 were written in sequence. All that really does is disprove the defence suggestion that an original page 56 had been removed to allow an interpolated page. In my view the suggestion was misconceived, because disproving it seems to have made the SCCRC feel that the entire allegation had been disproved, when it hadn’t been. The only other things we know are that pages 50 and 51 were written as a pair (not surprising, both dated 12/5/89), and that page 52 does NOT bear the imprint of page 51, or indeed of page 49 which is the apparently preceding page going by the date. The page that was on top of page 52 on the pad refers to a completely different case, and whatever imprint (if any) appears on page 50 is not recorded. So there’s nothing to tie 50/51 into the sequence at all. However, pages 45 to 48 are also interpolations, all dated 27/2/89, all describing the examination of the large pieces of baggage container which was done at Longtown, not Fort Halstead. Going back to page 44 returns us to Kent and 14/3/89. It’s completely incomprehensible why Hayes decided to shuffle the notes he made in February at Longtown into the sequence in the middle of March. Bearing all that in mind it’s not necessarily the case that two pages dated 12/5/89 being interpolated into the middle of work dated 15/5/89 is actually sinister. I don’t know what to make of it all. I missed a bit. The date on the negative of “photograph 117” is 22nd May 1989. Contrary to what has been alleged elsewhere, this is actually strong evidence that the photo was not taken much later and backdated. While it seems that some of the RARDE negatives were labelled with the date the photo in question was taken, it’s highly likely that some rolls of film were simply filed under the date the film was developed. It’s perfectly probable that photos taken on 12th May were developed on 22nd May. On the other hand, if a later photo was backdated and a false date appended, I’d expect that false date to be 12th May, not 22nd May. Of course it’s possible to dream up ways round all this, but extraordinarily difficult to construct a scenario that makes sense. If the collar was examined on 12th May but the PCB wasn’t in it, and the whole thing was reconstructed later to add the PCB fragment, including re-photographing it all, it could explain the date on the negative. It would however make a complete nonsense of all the speculation about interpolated pages, because no interpolation would have been needed, just a single page rewritten. Also, the photo appears to have been taken before the wad of paper was teased apart, which was done concurrently with the writing of page 50, so that by the end of the page the scraps were separated. You refer to the “now discredited” RARDE representatives, but while it’s true they both seem to have been at it in their own special ways, that doesn’t mean they were party to the introduction of fabricated physical evidence. Hayes is a bit more problematic, but I’m still dubious. It would have been possible to do a much better interpolation job of the material on page 50, if he’d really put his mind to it. Why draw attention to it with all these anomalies in page numbering and dates and so on? Unless it was all a huge double-bluff in the context of his shambolic system. I’m also struggling to figure out how the US agent or agents would approach Hayes in the first place, even if they knew he was into cherrypicking results and over-interpreting his findings to suit the police case (which is what his sins in connection to the IRA bombings investigations amount to). How could they know he wouldn’t immediately blow the whistle on them? PT/35b is screaming PLANT! so loud Evelyn Glennie could hear it. Except I’m absolutely struggling to figure out a rational narrative for when, how and who by. On the earlier incarnation of this page I commented that Ludwig had just shot a conspiracy theory I’d been mulling over. I should explain that. My original belief was that PT/35b was actually introduced into the chain of evidence some time in late 1989 or very early 1990, after the investigation had turned to Malta. This would have involved both Hayes and Feraday being complicit in producing material to allow retrospective provenance to be established for the item, as the provenance involved documents handwritten by both of them. This is a perfectly delicious theory, and quite a lot of people seem to believe it or something like it. It seems to be borne out by a lot of circumstantial evidence including the shambles of Hayes’s note-taking and the weird circumstances on the lads and lassies memo. However, the closer I focus in on this the less plausible it gets. I’m virtually conceding now that the PCB fragment really was on Hayes’s lab bench on Friday 12th May 1989. And God only knows why his notes are in that mess. If it was on his lab bench then, it’s a racing certainty it was inside that evidence bag that was logged into HOLMES on 17th January. The chain of custody is pretty tight. The weak moment is the weekend of 14th/15th January, when the bag of stuff from Blinkbonny was lying unsorted and undocumented in Dextar. Anyone could have added the collar, pre-loaded with the remarkably convenient goodies pointing to the right Toshiba model and the MST-13 timer, to the bag. Anyone who was in Dextar as of right. A number of FBI personnel certainly were, including Tom Thurman. One problem with this is that it pushes the plot to mislead the investigation towards Libya implausibly early. If the US agencies were doing that then, they pretty much had to have prepared the stuff before the crash. Which would mean they knew what was going to happen. I don’t like that idea one tiny little bit, but just because I don’t like an idea doesn’t mean we can all ignore it I suppose. However, Ludwig has just pointed to a second problem, a potentially fatal one. If the collar was the only bit of the shirt recovered, that explanation would have been fairly reasonable. However, as he has reminded me, there were four pieces. What about the other three? Really, nobody could engineer that neat straight line stretching out across Northumberland by planting stuff at Dextar. The whole thesis of the two debris trails was worked out months after the disaster. It took a hell of a lot of analysis to come up with the detailed plan and the explanation. In the initial weeks, all there was, was a warehouse full of bags of rubbish, labelled with OS grid references. And yet these four points are perfect. They continue on the line of the south debris trail exactly as they should, for light wind-blown items that originated from the position of the explosion. I don’t see how you could fake it. I’m beginning to think PT/35b really did fall out of the sky. Please, somebody, prove me wrong! Put forward a plausible planting scenario I’ve missed! I think you may have dismissed the significance of the negative dating anomalies too quickly. The date on which a photo was taken is a crucial element of its reliability as evidence, and I cant see how a flip-flop attitude to dating based on when taken/when developed could ever be tolerated. Like the anomaly with the notepad page numbering, the dating of the negatives is a red flag: what remains is to figure out exactly what it is trying to tell us.